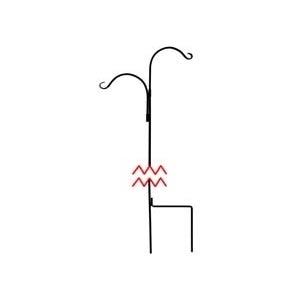 The Hookery extension hanger for plants and birdfeeders. It comes in a black powder coated protective finish. This 90 inch wrought iron double crane is handmade wrought iron from Vermont. It has a powder-coated black finish for lasting protection. A wonderful decorative accent for hanging baskets, birdfeeders, or plants. This 90 inch wrought iron crane is handmade wrought iron from Vermont. It has a powder-coated black finish for lasting protection. A wonderful decorative accent for hanging baskets, birdfeeders, or plants. This 70 inch iron crane is handmade wrought iron from Vermont. It has a powder-coated black finish for lasting protection. A wonderful decorative accent for hanging baskets, birdfeeders, or plants. This 48 inch wrought iron crane is handmade wrought iron from Vermont. It has a powder-coated black finish for lasting protection. A wonderful decorative accent for hanging baskets, birdfeeders, or plants. 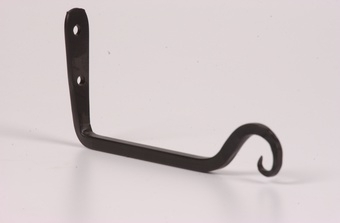 This 6 inch straight hanger is handmade wrought iron from Vermont. It has a powder-coated black finish for lasting protection. A wonderful decorative accent for hanging baskets, birdfeeders, or plants. 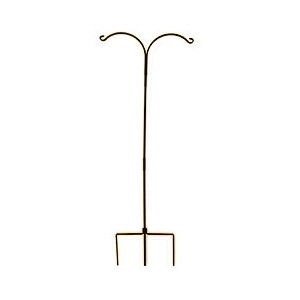 This 15 inch straight hanger is handmade wrought iron from Vermont. It has a powder-coated black finish for lasting protection. A wonderful decorative accent for hanging baskets, birdfeeders, etc. for your yard or garden. 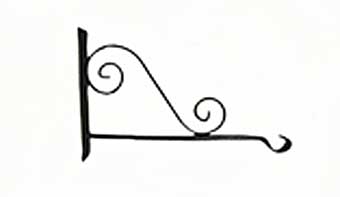 This 12 inch straight hanger is handmade wrought iron from Vermont. It has a powder-coated black finish for lasting protection. A wonderful decorative accent for hanging baskets, birdfeeders, etc. for your yard or garden. 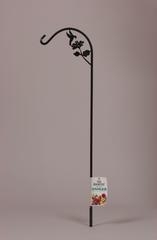 This 90 inch single hook crane hanger with decorative hummingbird is handmade wrought iron from Vermont. It has a powder-coated black finish for lasting protection. A wonderful decorative accent for hanging baskets, birdfeeders, or plants. 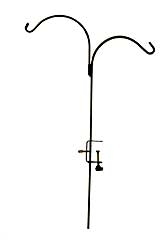 This attractive, single-hook crane garden hanger is made to accommodate your hanging plants and bird feeders. It has a 5/8 inch square steel stock and painted black. Overall, it measures 90 inches high. 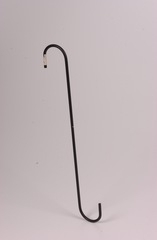 This 18 inch S-hook with a 2 inch eye is handmade wrought iron from Vermont. It has a powder-coated black finish for lasting protection. A wonderful decorative accent for hanging baskets, birdfeeders, or plants. 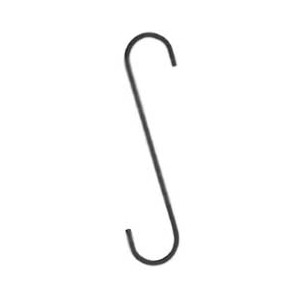 This S hook is an extension hanger for plants and bird feeders. 8 inch in length. This magnum crane quad hook with 4 hooks is handmade wrought iron from Vermont. It is 90 inches tall and 5/8 inch square stock. It has a powder-coated black finish for lasting protection. A wonderful decorative accent for hanging baskets, birdfeeders, or plants. This flared end J-hook is handmade wrought iron from Vermont. It has a powder-coated black finish for lasting protection. A wonderful decorative accent for hanging baskets, birdfeeders, or plants. 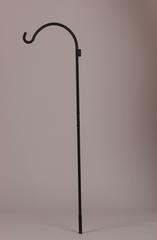 18 inch heavy duty forge hanger with scroll - green veing. 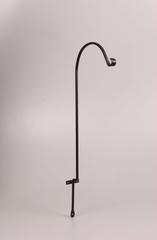 Can be mounted to pole/post or wall to hang flower baskets or bird feeders from. 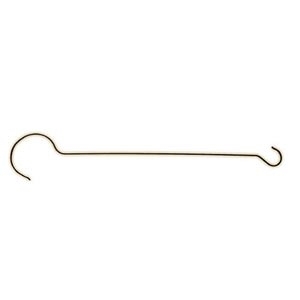 The Hookery crane is useful for hanging plants and birdfeeders. It comes in a black powder coated protective finish. 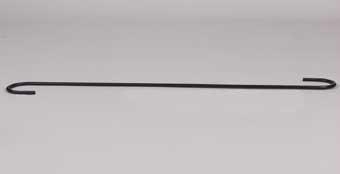 This 36 inch fence and deck hook is handmade wrought iron from Vermont. It has a powder-coated black finish for lasting protection. A wonderful decorative accent for hanging baskets, birdfeeders, or plants. 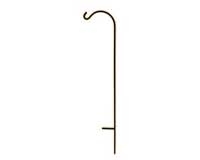 This 6 inch extension hook with a 2 inch opening is handmade wrought iron from Vermont. It has a powder-coated black finish for lasting protection. A wonderful decorative accent for hanging baskets, birdfeeders, or plants. 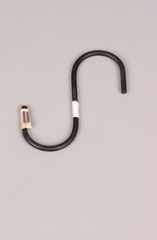 Extension hook is 24 inch in length and 1/4 inch stock. 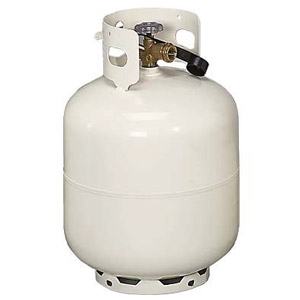 Has a 2 inch opening and comes with a black powder coat finish. 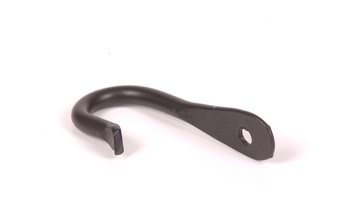 This 12 inch extension hook with a two inch opening is handmade wrought iron from Vermont. It has a powder-coated black finish for lasting protection. 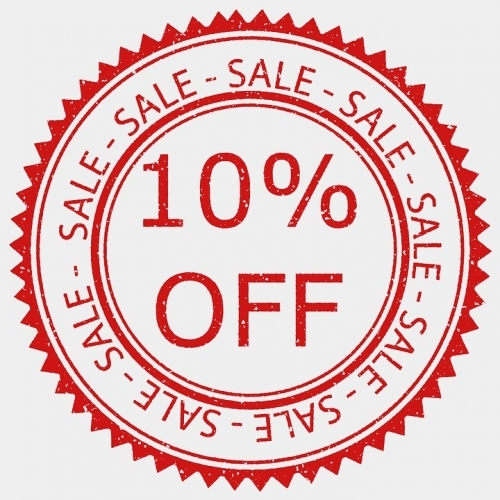 A wonderful decorative accent for hanging baskets, birdfeeders, etc. for your yard or garden. This 90 inch double hook crane hanger with decorative hummingbird is handmade wrought iron from Vermont. It has a powder-coated black finish for lasting protection. A wonderful decorative accent for hanging baskets, birdfeeders, or plants. This attractive, double-hook crane garden hanger is made to accommodate your hanging plants and bird feeders. 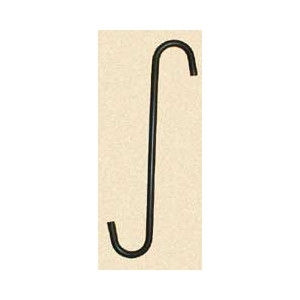 It has a double hook and is made of heavy-duty, 5/8 inch square steel stock and painted black. Overall, it measures 90 inches high with a push-in stabilizer anchor at the bottom. 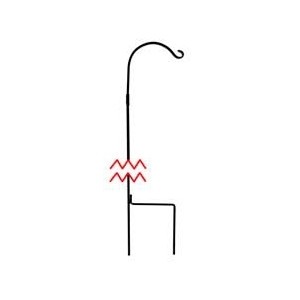 The two-piece pole slides together for easy assembly. Made in USA. 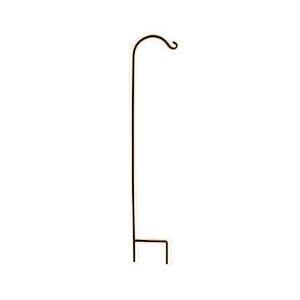 Hang a beautiful fern or other plant or perhaps a bird feeder with this handy adjustable deck hanger.&nbsp; Clamp fits 2x4 or 2x6 in rails.&nbsp; 36 inch length anger and 3/8 inch stock. 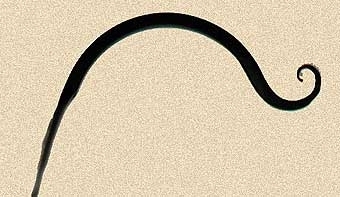 Wrought iron hanger with upturned hook. 6 inch in length.